The newest edition of Mint Error News Magazine, issue #24, is now available for free viewing and download. 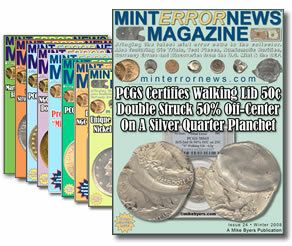 The quarterly magazine is published by Mike Byers and is an excellent tool for collectors who want to know the very latest mint error and variety coin news. The magazine is packed with outstanding coin photos, in addition to mint error information and the error coin price guide compiled by Al Levy of alscoins.com. Levy uses eBay to compile pages upon pages of recent error coin closing prices. The coin photos, as often described here, are like guides in themselves. They’re superb in identifying coin errors and deepening error and variety coin knowledge. Issue #24’s cover story discusses the unique and rare Walking Liberty Half Dollar mint error that was double stuck 50% off-center, and on a silver quarter planchet. The photos are amazing. A listing of the magazine’s table of contents is below. While the titles offer a guide in what to expect, they don’t do justice to the magazine’s content and vibrant photos. You simply must browse the magazine to find out for yourself. CoinNews hosts “The Error Coin Price Guide” generously provided by minterrornews.com. By using the photo error coin guide, you can quickly find an error coin of interest, click its image and immediately go to the appropriate page with more information. I Have a 2003 quarter that is perfect silver on front, and is all bronze or copper on the back side. its a maine comimative 1830 coin. light house and ship ,all bronze in color , Looks like thats the way it should be. Right me back on if rair. thank you.